Every Wednesday from 12:15 – 1:15 pm, the Friedman School of Nutrition Science and Policy holds their Friedman School Speaker Series. Speakers are nominated and chosen for not only their own work, but how their topic communicates with the rest of the series. Click here to learn more about Friedman crafts their speaker line-up. 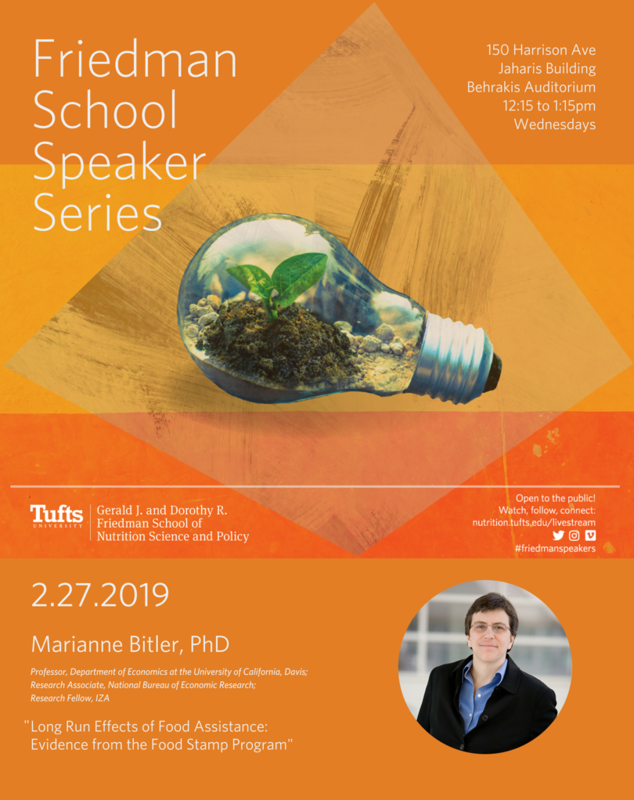 This Wednesday, February 27, Dr. Marianne Bitler will be giving a talk entitled “Long Run Effects of Food Assistance: Evidence From the Food Stamp Program.” Dr. Bitler is a Professor in the Department of Education at the University of California, Davis. Click here to learn more about Dr. Bitler, her upcoming talk, and academic research. The Friedman School Speaker Series is a valuable resource for Tufts students on all campuses. Students can view the series in action by watching on the live stream, or can also check out Friedman’s Vimeo to watch past speakers.